In a microwave-safe, large bowl, stir the oats and the water together. Microwave the mixture on a high setting between three and four minutes until the water has absorbed and the oats have cooked. Watch the oatmeal carefully to keep it from boiling over. From there, divvy up the oatmeal into two bowls, and then pour a ¼ cup of any milk of your choosing over each serving. Divide the pecan halves, dried tart cherries, and sliced banana between both bowls before drizzling one or two tablespoons of Manuka honey over each serving. 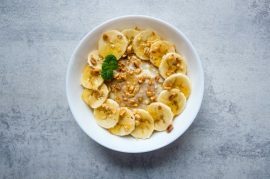 Tip: Because this oatmeal recipe has a sweeter flavor to it, thanks to the Manuka honey, it’s better to use the contrast of tart cherries rather than sweet cherries against the honey, especially if you want to use the entire suggested amount of honey. 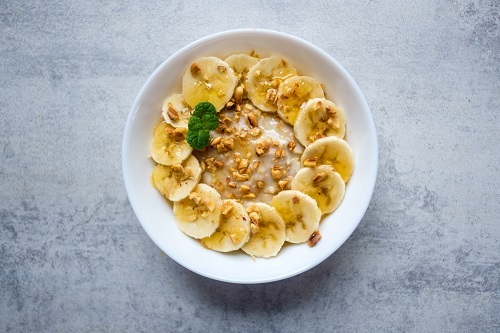 Tip: If you feel like going all the way and making the breakfast version of a banana split, then you can always add a little bit of chocolate into your oatmeal. To keep it as healthy as possible, you can sprinkle on some cacao nibs, which add a purer chocolate flavor but without flooding it with sugar. Cacao nibs also have a good crunchy texture to them. Tip: It’s possible to make this recipe using quick oats instead of traditional rolled oats, but you need to decrease the cook time. Regardless of the kind you use, several 30-60 second intervals should be enough. Be sure to stir in between every interval, as this helps in allowing even cooking while also preventing your oatmeal from overflowing. If you need to order some Manuka honey to make this delicious recipe, click here. And, remember, we offer FREE shipping on all orders of $150 or more.